After many requests, here is a decent map of the museum ROW with some common questions answered. By spring 2015, 2.5 miles of track has been completed to the Top of the Mountain where a run-around track has been added utilizing the grade of the stub siding that the original railroad used to double the hill. Since the above map was made, the 3-way switch was not constructed, instead a traditional "ladder" track was used to feed the carbarn and woods track. All track shown on that map (with the exception of the 2 roundhouse stalls) is complete. All structures, with the exception of the roundhouse) are now complete. Nice job on the map. A question Moody shows on his hand drawen map in Robert Jones book just north of TOM down toward Trout brook brige that in 3/4 mi there are 5 curves that wiggle down the mountain can these be seen or has this part of the grade not been cleared yet? I think the curves on Moody map are just an exaggeration. The line on my map was plotted from GPS readings. While GPS is not perfect - and only reasonably accurate - it would be close enough given the scale of the map I have drawn. The Moody curves were greatly exaggerated. There might be five or pretty gentle curves on the Mountain, some of which are short enough you won't see them on the map. as this area appears to be heavely wooded. The best way to print the map is to right-click on it and choose "Save Picture As". Then, save the image as a JPG file in your 'My Pictures' folder. Finally, open your Pictures Folder (on your PC), double-click the map, and print it using the software provided for doing so. Thanks Ed for the map. Now I know how much of the current right of way is operational and what still need to restored. Great job Ed. Of course, in a few weeks, it will be out of date - I hope! An updated map would show the mainline with an additional (scale) 1/4 inch of track towards TOM. 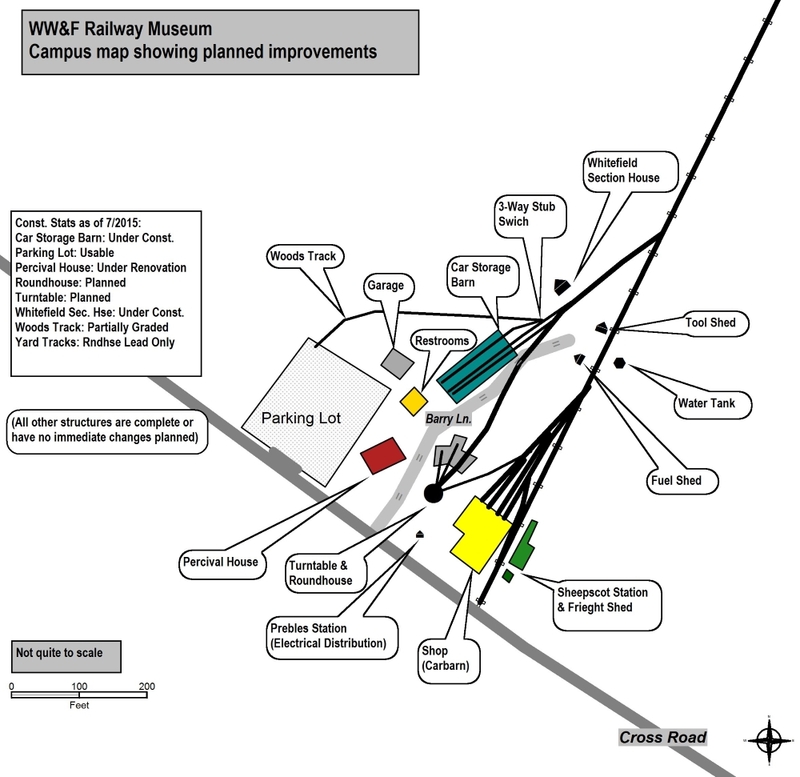 The next big change to the museum trackage will probably be the installation of the switch and the first part of the spur for the North Yard, although it would not be indicated on the map. This is the first map I've seen that gave me an idea of what you guys have done. Great map! Great ROW work! Another thought. From my college ROTC map class knowledge (a little knowledge is a dangerous thing), I see that you are going to go between some relatively steep hills soon. Is this going to be a good view for the riders? It seems like it would be quite exciting. Is it more expensive to lay track through this area or is the ROW still there?